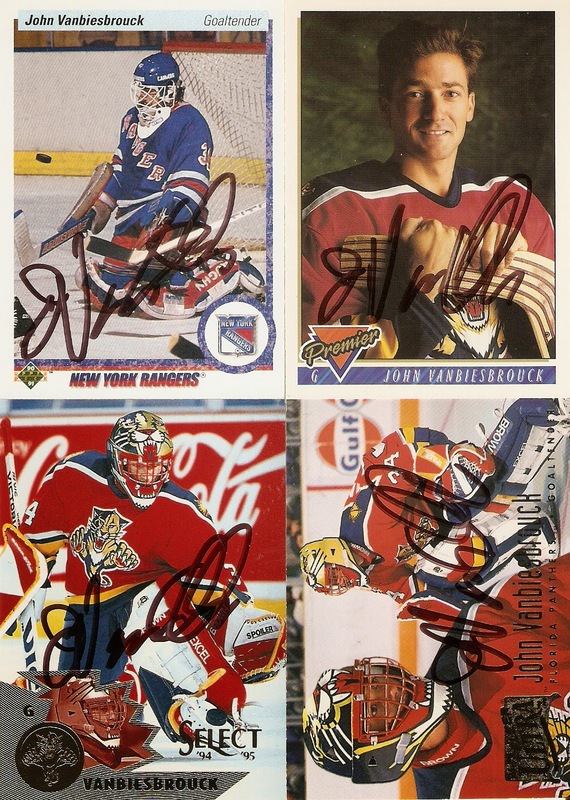 I was very excited to get a quick TTM return from one of my all-time favorite goaltenders, John Vanbiesbrouck, who signed four hockey cards. I became kind of a Panthers fan for a little bit during the mid '90s, and on this team, they had Scott Mellanby, Brian Skrudland, and Ed Jovanovski, but Vanbiesbrouck was definitely the man. Not only that, but he had one of my all-time favorite goalie masks, with such a simple, yet distinct, design. John was nice enough to sign these cards for me that were sent to him through the Muskegon Lumberjacks of the USHL, where he is the team's general manager. The cards were sent out Jan. 31st, and arrived just 14 days later.